Recycle - What Goes Where? Where Do I Live in the RDN? Can I have a Secondary Suite? Be Grab and Go Ready! Burn It Smart Campaign Begins! Is Your Chimney Up To Snuff? The rezoning of the Fairwinds Lakes District was completed in July 2014 with the formal adoption of the zoning bylaws and the Phased Development Agreement (PDA). The PDA is a legally binding agreement between the RDN and Fairwinds which outlines development phasing and provision of community amenities in the Lakes District over the next 20 years. Management Plan development ran from October 2014 to June 2015, with two Public Open House events. A draft plan was available for public review and comment in May 2015 and a final plan was submitted to the Regional Board for review in June 2015. 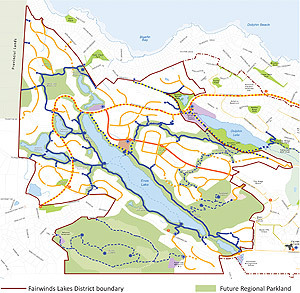 Approximately 100 ha of parkland, including over 16km of trail, will be dedicated over the course of six development phases as part of the rezoning and subdivision of 287 ha of land owned by Fairwinds. Regional park dedication will help to protect the site’s natural features while providing opportunities for both passive and active recreation. The first Open House event was held on November 18, 2014, from 5:00-7:30pm at the Nanoose Place Community Centre. Project consultants and park staff were on hand to share information and answer questions about management plan development. A Public Survey was available at the Open House event and online from November 18 to December 9, 2014. Thank you to everyone who participated. The second Open House event was held on May 13, 2015, from 5:00-7:30pm at the Nanoose Place Community Centre, 2925 Northwest Bay Rd, Nanoose Bay. RDN staff and project consultants were on hand to receive feedback on a draft of the Management Plan. A Public Survey was available at the Open House event and online from May 1 to May 21, 2015. Thank you to everyone who participated. On June 23, 2015 the RDN Board approved the Management Plan for the Fairwinds Lakes District Regional Park in principal pending submission of the final Enos Lake Protection and Monitoring Program (Appendix E) by the developer. The final Management Plan, and all completed Appendices, are posted below. The RDN Board also formally approved the proposed name of Qwiyulass Regional Park for the future park within the Fairwinds Lakes District. Qwiyulass is the Snaw-naw-as name for Notch Hill; it is a hul’qumi’num term that means “the watch.” The name was suggested by public survey respondents and supported by the Snaw-naw-as First Nation and the project Advisory Committee. Please contact Kelsey Cramer, Parks Planner, kcramer@rdn.bc.ca 250-248-4744, x3664. All Rights are reserved. Material may not be used or reproduced without the prior written consent of the Regional District of Nanaimo.